Materialism is a psychological construct reflecting the extent to which an individual believes that it is important to attain money, possessions, image, and status, relative to other aims in life. This chapter reviews evidence showing that materialism is a fundamental aspect of the human value system that stands in relative conflict with intrinsic values concerning personal growth, close interpersonal relationships, and helping others. Meta-analytic results and longitudinal studies demonstrate that people report lower levels of well-being when they prioritize materialistic values and goals. Because materialism is also negatively associated with pro-social and pro-environmental attitudes and behaviors, a strong focus on such aims is likely to undermine the well-being of other people, other species, and future generations. Recent studies show that materialism can diminish when people receive interventions that encourage intrinsic values, that involve deep inward reflections, or that lead them to disengage from and question the messages of consumer culture. This chapter has four main goals. First, it will show that the construct of materialism can be understood as an aspect of the human value system. Second, it will review the substantial empirical evidence which has documented that people experience lower levels of personal well-being to the extent they place a relatively high priority on materialistic values and goals. Third, it will show that when people prioritize materialistic values and goals, they are also likely to hold attitudes and engage in behaviors that interfere with the ability of others to live well. Finally, the chapter will describe some interventions that hold promise for decreasing materialism and increasing well-being. Support for a value-based conceptualization of materialism comes from research showing that such aims consistently emerge as a fundamental set of values across cultures. For instance, Schwartz’s (1992) cross-cultural work has identified a cluster of self-enhancing values that includes “wealth,” “preserving my public image,” and “social power,” as well as being “ambitious,” and “influential.” Further, Burroughs and Rindfleisch (2002) demonstrated that the Richins and Dawson (1992) measure of materialistic values is highly positively correlated with these self-enhancing values (as well as with hedonistic values). Using a measure of personal “aspirations” or goals, Kasser and Ryan (1996) similarly showed the emergence of an extrinsic factor composed of aspirations for financial success (e.g., “I will be financially successful”), image (e.g., “My image will be one others find appealing”), and popularity (e.g., “I will be admired by many people”). Grouzet et al. (2005) demonstrated that these three extrinsic aims consistently cluster together in the goals of college students from 15 nations. This body of research suggests that people experience aims for money, possessions, power, status, and image as being relatively compatible with each other. For example, one can relatively easily pursue both financial success and image aspirations, given that image is usually expressed through possessions (e.g., cars, handbags) that require some level of financial success to purchase. Similarly, wealth typically brings access to power, and power typically provides opportunities to attain wealth. The finding that certain values are compatible with each other carries with it a corollary: Certain values are also in conflict with each other. In the late 1980s and early 1990s, Schwartz (1992) made the important discovery that across cultures the human value system is organized in a remarkably consistent fashion, such that to the extent a person prioritizes a particular value, s/he is also likely to prioritize certain other compatible values and to de-prioritize certain other conflicting values. Schwartz represented the statistical extent of compatibility and conflict between values via a “circumplex” model in which the aims that people experience as relatively consistent with each other are next to each other in the circle, the aims that are in relative conflict are on opposite sides of the circle, and the aims that are neither in conflict nor compatible are approximately 90 degrees apart on the circle. Figure 1 shows a circumplex model derived from the cross-cultural work my colleagues and I conducted on the importance people place on personal goals (Grouzet et al., 2005). In the west and south-west portion of the circle, the reader can see that goals for financial success, popularity, and image cluster together; their nearness to each other represents their relative compatibility, i.e., that they are relatively easy to pursue together. It can also be noted that financial success goals are relatively compatible with hedonism (as Burroughs and Rindfleisch (2002) also found) and that image and popularity goals are relatively compatible with conformity goals. These findings are intuitively sensible, as money is often used to purchase sensually pleasurable products and services, and one usually has to conform somewhat to others’ opinions in order to obtain their praises. Figure 1. 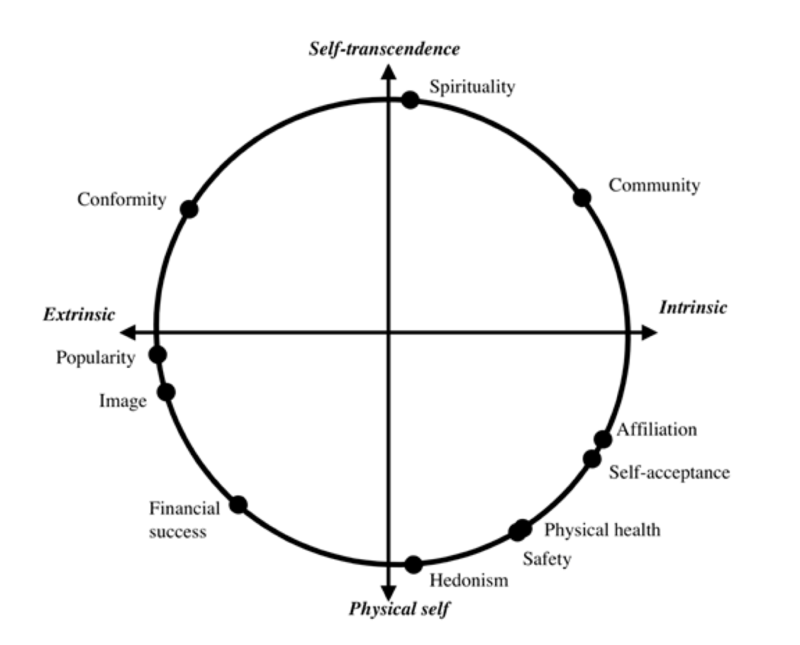 Circumplex model representing the relative compatibility of extrinsic, materialistic goals (for financial success, image, and popularity) and their relative compatibility and conflict with other goals (from Grouzet et al., 2005, Journal of Personality & Social Psychology). Reprinted by permission of the American Psychological Association. Note as well the aspirations on the opposite side of the circumplex from these extrinsic values. Here the reader will find the intrinsic values for self-acceptance (e.g., “I will choose what I do, instead of being pushed along by life”), affiliation (e.g., “I will feel that there are people who really love me”), and community feeling (e.g., “I will help the world become a better place”). The arrangement depicted in Figure 1 reflects that people tend to experience the intrinsic aims as in relative conflict with materialistic, extrinsic aims. That is, these values stand in dynamic tension with each other, such that it is relatively difficult to simultaneously pursue them. For example, the strong opposition between financial success and community feeling goals reflects the rather obvious fact that it is difficult to be simultaneously greedy and generous. Similarly, the opposition between image/popularity and self-acceptance aspirations reflects that in order to be popular and praised for one’s image, one must be concerned with what others will approve of, an approach to life that is typically inimical to one’s own personal growth (Rogers, 1961). Notably, goals for financial success and spirituality are also at opposite ends of the circumplex, reflecting the conflict between these aims mentioned in most religious traditions (see e.g., Belk, 1983). Parallel results occur with Schwartz’s (1992) values measure, in which the self-enhancing values of money, power, and achievement stand in relative conflict with self-transcendence values of universalism (e.g., “unity with nature,” “social justice”) and benevolence (e.g., being “honest” and “helpful”). Burroughs and Rindfleisch (2002) similarly found that Richins and Dawson’s (1992) measure of materialism was in relative conflict with these universalism and benevolence values, as well as with values for community and religiosity. In sum, this body of evidence strongly supports the validity of conceiving of materialism as a set of values and goals that people have for money, possessions, power, status, and image. It further suggests that prioritizing materialistic values comes at the cost of de-prioritizing certain other values. As will be described below, this fact has important ramifications for well-being. One of the primary questions that researchers have asked about materialism is whether prioritizing such values promotes or hinders people’s personal well-being. Since the earliest studies on this topic (Belk, 1985; Cohen & Cohen, 1996; Kasser & Ryan, 1993, 1996; Richins & Dawson, 1992), dozens more have been conducted. Dittmar, Bond, Hurst, and Kasser (2014) recently undertook a thorough search for and subsequent meta-analysis of published and unpublished studies on the relationship between materialism and well-being. The search yielded 175 studies using 258 distinct samples across which researchers reported 749 associations between a measure of materialism and a measure of personal well-being. Across the 749 effects, Dittmar et al. (2014) found the mean size of the correlation between materialism and well-being to be -.15; when only a single effect was selected from each of the 258 distinct samples (to control for non-independence), the effect was also -.15 (95% CI = -.18 to -.13). Thus, the negative association between materialism and well-being appears to be quite robust, even if it is not large. Dittmar et al. (2014) also examined whether the size of the effect depended on the type of materialism measure that researchers had used; to test this, they categorized 143 distinct materialism measures into eight basic types. Substantial variation in effect sizes was notable. Stronger associations between materialism and well-being (rs between -.19 and -.16) occurred when researchers used multi-faceted scales that assessed materialistic values and beliefs (e.g., Richins & Dawson, 1992) or scales that assessed the importance of goals for money, image, and popularity relative to other non-materialistic goals (e.g., Kasser & Ryan, 1993, 1996). Weaker effects (rs between -.07 and -.11) were typically obtained when researchers used measures of materialism that were quite brief, that assessed general beliefs about money and wealth, or that assessed the value participants placed on money in absolute (rather than relative) terms. The size of the association between materialism and well-being also depended on how researchers measured well-being. Dittmar et al. (2014) placed 497 well-being measures into 12 distinct categories to examine this issue. Significant effects were obtained for all 12 categories of well-being, but the size of the effects varied substantially. In decreasing order of effect size, materialism was associated with more compulsive consumption (r = .44), engaging more frequently in risky health-related behaviors (like smoking cigarettes and drinking alcohol, r = .29), a more negative self-image (r = .28), less positive affect (r = -.23), more depression (r = .19), lower overall subjective well-being (r = -.19), a less positive self-image (r = -.17), more anxiety (r = .17), more symptoms of a variety of DSM Axis I disorders (r = .16), worse physical health (r = -.15), more negative affect (r = .15), and lower life satisfaction (r = -.13). It thus appears that there are manifold types of well-being negatively related to materialism. Dittmar et al. (2014) also tested 25 potential moderators of the association between materialism and well-being; these included study, sample and cultural characteristics. 18 of these potential moderators were non-significant, and seven were significant. Specifically, the negative relationship between materialism and well-being was stronger: a) when well-being was assessed with questionnaires (rather than interviews); b) when participants were under (rather than over) age 18 years; c) in samples that included large percentages of women (rather than men); d) in samples that included relatively few (vs. many) business, economics, and law students and practitioners; e) in samples from nations with less (rather than more) economic inequality; f) in samples from nations with slower (rather than faster) economic growth; and g) in samples from nations that place relatively high (vs. low) importance on pleasure and an exciting life. Importantly, none of these significant moderators revealed any conditions under which the relationship between materialism and well-being was positive; instead, the effects were more weakly negative. In sum, the Dittmar et al. (2014) meta-analysis demonstrates that the relationship between materialism and well-being is small but consistently negative. Certain measures of materialism tend to produce stronger results than do others, and certain types of well-being are more strongly related to materialism than are others. Further, although some sample and cultural characteristics decrease the size of the negative relationship, the association between materialism and well-being is consistently negative across different sorts of people and cultural circumstances. Longitudinal and experimental studies. A clear weakness of Dittmar et al.’s (2014) meta-analysis is that it included only studies that were correlational and cross-sectional. A handful of studies have used more sophisticated methodologies to test how materialism and well-being relate to each other. One approach researchers have taken is to test how changes in materialism over time correlate with changes in personal well-being over time. Studies of Canadian college students (Hope, Milyavskaya, Holding, & Koestner, 2014) and of Chinese business and engineering students (Jiang, Song, Ke, Wang, & Liu, 2016) demonstrate that well-being declines as materialistic values increase over the course of one year. Kasser et al. (2014) also examined longitudinal associations in samples of at-risk U.S. young adults, recent U.S. college graduates, and Icelandic adults over time frames ranging from 6 months to 12 years; in all three samples, individuals who increased in materialism over the relevant time period reported decreases in well-being. These person-level results are complemented by nation-level time-series analyses in Norway (Hellevik, 2003) and the U.S. (Twenge et al., 2010) revealing that as materialism levels increase in cohorts of citizens, their overall well-being declines. A few experimental studies have tested whether focusing on materialistic values might cause decreases in well-being. Notably, however, ethical and practical difficulties mean that these studies typically involve briefly exposing study participants to relatively subtle materialistic primes (vs. control materials) before state well-being is assessed; it seems doubtful that such designs can shed much light on the types of well-being deficits that occur in people who dispositionally prioritize materialistic values and goals. Nonetheless, it is worth noting that increases in negative affect and decreases in positive affect have been observed after participants view luxury consumer goods (vs. neutral images; Bauer, Wilkie, Kim, & Bodenhausen, 2012) and think about their time as money (vs. control activities; Devoe & House, 2012). On the other hand, Solberg, Diener, and Robinson (2004) found no effects of other sorts of activations of materialism on well-being. Explaining the negative association. A variety of explanations have been proposed for the consistent negative correlation between materialism and well-being. I will not attempt to review them all here, but will instead focus on the four explanations that have received the most attention in the research literature. One possibility is that materialistic individuals experience decrements in well-being because they are not fully successful at attaining their goals of making money and obtaining possessions; this can be called the goal-attainment perspective. For example, Nickerson, Schwarz, Diener, and Kahneman (2003) found that the correlation between materialism and general life satisfaction was relatively weak (or non-existent) for wealthy individuals. That said, however, Nickerson et al. found that personal wealth did not moderate the negative correlation between materialism and satisfaction with relationships. Other research has found that progress at and attainment of extrinsic goals for money, image, and popularity do not improve well-being (Niemiec, Ryan, & Deci, 2009; Sheldon & Kasser, 1998); such results seem inconsistent with a goal-attainment perspective. Further, Dittmar et al.’s (2014) meta-analysis found no evidence that the association between materialism and well-being is consistently moderated by personal or household income. Meta-analytic results also showed that materialism’s negative relationship with well-being is stronger in more (vs. less) economically-developed nations (i.e., those characterized by more income equality and slower economic growth); the goal-attainment perspective would seemingly predict a weaker relationship in more (vs. less) economically-developed nations, given the relative ease with which material possessions and wealth can be obtained in wealthier locales. In sum, while it seems premature to discard the goal-attainment hypothesis, this explanation of why materialism is negatively related to well-being has weak and relatively contradictory evidence. A second explanation (Sirgy, 1998) suggests that people with strong materialistic values and goals experience substantial financial dissatisfaction, given that someone else is almost always wealthier and has nicer possessions, and given that marketplaces continually introduce new consumer goods that are advertised as being better than what one already owns. This dissatisfaction is thought to spill over into a more generalized dissatisfaction with one’s life. Dittmar et al. (2014) tested this intriguing hypothesis using multi-variate meta-analysis for mediation on studies that reported relevant data; no support for the spill-over hypothesis was forthcoming, however. A third, environmental congruence, hypothesis (Sagiv & Schwartz, 2000), suggests that materialism results in lowered well-being when people find themselves in environments that are at odds with their values, as this leads to interpersonal conflicts, feelings of alienation, and fewer affordances for one’s goals. Sagiv and Schwartz supported this hypothesis by showing that self-enhancing values (for power, status, money, etc.) were negatively correlated with well-being in psychology students but uncorrelated with well-being in business students. Other studies, however, have found that the negative correlation between materialism and well-being persists in business-oriented samples (e.g., Jiang et al., 2016; Kasser & Ahuvia, 2002), and that married couples who are both high in materialism have lower quality marriages than couples who are both low in materialism or couples with mismatched values (Carroll, Dean, Call, & Busby, 2011). Dittmar et al.’s (2014) meta-analysis found mixed support for the environmental congruence hypothesis. On the one hand, meta-analytic results showed that the negative association between materialism and well-being is somewhat weaker in samples composed of a large (vs. small) percentage of business, law, and economic students and practitioners. On the other hand, the association between materialism and well-being was still negative in samples with many business, law, and economic students and practitioners. Further, the negative association between materialism and well-being was stronger in samples from cultures more (vs. less) focused on pleasure and excitement; such a finding is a problem for the environmental congruence hypothesis because hedonistic goals are generally consistent with materialistic strivings (see Burroughs & Rindfleisch, 2002; Grouzet et al., 2005). A fourth explanation (Kasser, 2002) has been derived from the research literature on the organization of value-systems (reviewed above), intrinsic and extrinsic motivation (Ryan & Deci, 2017), and humanistic/existential theories (e.g., Fromm, 1976; Maslow, 1954; Rogers, 1961). This need-based hypothesis suggests that people have inherent psychological needs to choose their own behavior (autonomy), to feel connected and close to other people (relatedness), and to be efficacious at their valued behaviors (competence). When these needs are well-met, well-being is high, but when these needs are frustrated, lower well-being occurs (see Ryan & Deci, 2017). The need-based approach proposes two main reasons why the strong prioritization of materialistic values and goals is associated with lower well-being. First, as people pursue their materialistic values and goals, they are likely to have many experiences that directly interfere with need satisfaction; for example, their strong pursuit of money likely leads them to spend more time working long hours at relatively uninteresting tasks they feel forced to complete, thereby interfering with the satisfaction of the need for autonomy. Second, because extrinsic values tend to be in relative conflict with intrinsic values (see Figure 1), people who prioritize materialistic values are less likely to spend time in the intrinsically-oriented pursuits that generally provide experiences of need satisfaction; for example, a person might spend so much time working or shopping in pursuit of her materialistic aims that she has less time for activities relevant to family or helping others, thereby interfering with the satisfaction of the need for relatedness. Kasser (2002) reviewed a variety of types of studies demonstrating support for this hypothesis, and Dittmar et al.’s (2014) meta-analysis showed that (dis)satisfaction of needs for autonomy, competence, and relatedness each partially mediated the negative association between materialism and well-being. In addition, Kasser et al. (2014, Study 2) found that the negative association between changes in materialism and changes in subjective well-being over two years was fully mediated by changes in need satisfaction, such that individuals who became more materialistic over time reported decreasing levels of need satisfaction, which, in turn, explained their decreases in well-being; see Wang, Liu, Jiang, and Song (2017) for similar results. In sum, while there appears to be substantial empirical agreement that materialism is negatively associated with well-being, a consensus has not been reached as to why that is the case. At present, the need-based approach appears to have the most consistent empirical support of the four explanations reviewed here, but more research is needed on other sensible explanations that have been put forth (e.g., that materialism is an expression of traits such as neuroticism or agreeableness (Otero-Lopez & Villardefrancos, 2013; Roberts & Robins, 2000; Watson, 2014). In addition, a growing body of research shows that materialism is negatively associated with financial well-being and academic performance (see Kasser, 2016a); further research is also needed to examine materialism’s negative relationships with these outcomes. While living a happy, satisfying life free from depression, anxiety, compulsive consumption, and substance abuse is clearly part of what it means to “live well,” from my perspective, it is only part. Individuals exist in families, communities, and ecospheres in which their actions affect the lives, and thus the well-being, of other people, other species, and future generations. Thus, it is theoretically possible that some individuals could experience relatively high levels of personal well-being while also behaving in ways that hinder the well-being of others. Such individuals would certainly not be “living well together” (Deneulin & McGregor, 2010). As will be shown next, materialistic values are associated with a variety of attitudes and behaviors that are likely to undermine others’ well-being. This is probably due to the fact, reviewed in the first section of this chapter, that materialistic aims stand in relative opposition to values such as helping others, being honest, having close and loving relationships, and caring about social justice, equality, and unity with nature (see Figure 1). That is, as people place increasing priority on materialistic values, they tend to place less priority on the very values that would orient them towards nurturing their interpersonal relationships, contributing to the wider community, and behaving in ecologically sustainable ways. In terms of their close interpersonal relationships, people who prioritize materialistic values and goals have lower-quality romantic and friend relationships (Carroll et al., 2011; Kasser & Ryan, 2001; Solberg et al., 2004). Perhaps this is because materialistic/extrinsic values are also associated with treating others in less empathic ways (Sheldon & Kasser, 1995), acting competitively rather than cooperatively (Sheldon, Sheldon, & Osbaldiston, 2000), and being more Machiavellian (McHoskey, 1999) and narcissistic (Kasser & Ryan, 1996). None of these are characteristics likely to support high quality interpersonal relationships. Regarding potential effects on the well-being of the members of one’s community, materialism is negatively associated with engaging in pro-social activities (Briggs, Landry, & Wood, 2007; Sheldon & Kasser, 1995) and positively associated with engaging in anti-social behaviors (Cohen & Cohen, 1996; Foulkes, Seara-Cardoso, Neumann, Rogers, & Viding, 2014, Kasser & Ryan, 1993). Individuals who prioritize materialistic values also engage in more interpersonally deviant workplace behaviors (Deckop, Giacalone, & Jurkiewicz, 2015) and care less about corporate social responsibility (Kolodinsky, Maden, Zisk, & Henkel, 2010), compared to their less materialistic counterparts. The broader community can also be negatively influenced by the anti-egalitarian, prejudicial, and socially dominant attitudes common in people who prioritize materialistic values (Duriez, Vansteenkiste, Soenens, & DeWitte, 2007; Flanagan, Gallay, Gill, Gallay, & Naana, 2005). Ecological sustainability is another aspect of “living well together” with which materialism appears to interfere. To test this idea, Hurst, Dittmar, Bond, and Kasser (2013) meta-analyzed published and unpublished data from 13 independent samples that reported 26 different effects; results showed that materialism was negatively associated with pro-environmental attitudes (r = -.22, 95% C.I. from -.33 to -.11) and behaviors (r = -.24, 95% C.I. from -.30 to -.17). Apparently the desire for more and more money and stuff is one factor that leads people to treat the planet in ways that leave less for other people, other species, and future generations to meet their needs. The conclusions that can be drawn from the correlational studies reviewed thus far are strengthened by experiments in which researchers momentarily activate materialistic values in study participants. After being primed with money-relevant (vs. control) stimuli, adults and children distance themselves more from others and behave in less pro-social ways (Gasiorowska, Zaleskiewicz, & Wygrab, 2012; Goldberg & Gorn, 1978; Roberts & Roberts, 2012; Vohs, Mead, & Goode, 2006; Wierzbicki & Zawadzka, 2016). Priming with money (vs. control) stimuli also leads to increases in social dominance orientation (Caruso, Vohs, Baxter, & Waytz, 2013) and more selfish behaviors in community and environmentally-relevant resource dilemmas (Bauer et al., 2012; Frey & Oberholzer-Gee, 1997). Cross-national findings yield similar conclusions. Kasser (2011) obtained data on the extent to which citizens of 20 economically-developed nations prioritized hierarchy and mastery cultural values (i.e., values for money, status, power, achievement, etc. ; Schwartz, 1999) relative to egalitarian and harmony values (i.e., self-transcendence and intrinsic values). After controlling for variations in national wealth, results showed that, compared to nations less focused on wealth, status, etc., more materialistic nations had children with lower levels of well-being, aimed more advertising per hour at children, had national maternal leave policies that were less generous, and emitted more CO2 per capita (thus contributing to more climate disruption). In sum, the existing evidence consistently documents that the more that people (and cultures) prioritize materialistic values and goals, the less kindly they treat other people and the planet. Such behaviors almost certainly will undermine the well-being of other people, other species, and future generations. Compared to work on materialism and personal well-being, the body of literature on materialism and others’ well-being is still relatively new and under-researched. More work is needed in an array of diverse cultures with people of varying ages to explore the generalizability of these results. Future research is also required to test why materialistic values are negatively associated with pro-social and pro-environmental attitudes and behaviors; while the conflicting values perspective outlined at the start of this section seems a sensible hypothesis, it has not received sufficient direct empirical scrutiny. Given the array of problems associated with highly prioritizing materialistic values and goals, it seems worthwhile to develop ways to diminish their prevalence in people, organizations, and society. One approach, of course, is to implement policies aimed at this end; I have written elsewhere about such policies (see Kasser, 2016a, 2016b; Kasser & Linn, 2016) so will not discuss those types of recommendations in the current chapter. Instead I will review three types of person-level interventions that preliminary research suggests hold particular promise for decreasing materialism. The first set of interventions is derived from research reviewed above on the human value system. Recall that this body of work shows that materialistic values stand in relative conflict with intrinsic, self-transcendece, and spiritual values (see Figure 1). As such, if people are encouraged to more highly prioritize these latter types of aims, then their focus on materialistic values should diminish. Indeed, several short-term experiments (Dechesne et al., 2003; Fritsche, Jonas, Kayser, & Koranyi, 2010; Stillman, Fincham, Vohs, Lambert, & Phillips, 2012; Weinstein, Przybylski, & Ryan, 2009) have found just that: Priming people with spiritual, pro-environmental, and pro-social values results in short-term decreases in materialistic values and behavior. Similar results were also obtained in a more extensive, multi-week intervention conducted by Lekes, Hope, Gouveia, Koestner, and Philippe (2012). In this study, college students were randomly assigned to write about either their two most important intrinsic values or their typical daily tasks (e.g., cooking). Participants in the intervention group received emails over the course of the next month reminding them of their intrinsic values, inviting them to reflect on those values, and providing them with inspirational quotes relevant to those values; participants in the control group received parallel emails. Results showed that at the end of the study, the control group’s values were unchanged, but those participants in the intrinsic-activation group who reported getting immersed in the study’s activities shifted away from extrinsic, materialistic values and toward intrinsic values. Further, this shift in values was associated with increases in personal well-being. Unfortunately, Lekes et al. did not follow the participants for very long after the intervention ended, so we do not yet know whether this promising type of intervention can have more sustained effects on people’s values and well-being; future research could certainly investigate whether this is the case. A second type of intervention shown to decrease materialism involves inward reflection. Sheldon, Arndt, and Houser-Marko (2003) found that when people are merely asked to pause and reconsider the way in which they have previously rated their values, they typically, on second thought, place less importance on extrinsic and more importance on intrinsic values. Another type of inward reflection associated with low levels of materialism is mindfulness, or a non-judgmental awareness of one’s experience (Brown & Kasser, 2005); in fact, training in mindfulness can make people more satisfied with their current financial situation, which, in turn, can increase their well-being (Brown, Kasser, Ryan, Linley, & Orzech, 2009). Gratitude reflections also cause people to de-prioritize materialistic values (Lambert, Fincham, Stillman, & Dean, 2009), as do deep reflections on one’s own death. That is, while brief reminders of one’s death typically increase materialism (e.g., Kasser & Sheldon, 2000), a few studies have documented that engaging in deep, sustained reflections about one’s death decreases materialistic values and behaviors (Cozzolino, Staples, Meyers, & Samboceti, 2004; Lykins, Segerstrom, Averill, Evans, & Kemeny, 2007); these effects are particularly strong for people high in the personality trait of Openness to Experience (Prentice, Kasser, & Sheldon, 2017). Together, this literature suggests that interventions involving inward reflection might decrease materialism, but the processes involved in this effect are not well-understood. Does inward reflection address and alleviate the feelings of insecurity known to orient people towards materialistic values (see Kasser, 2016a)? Does reflection help people get in touch with their psychological needs, and thus orient them towards intrinsic values? Is mindfulness really the catalyst? These are questions future research could address. The third type of intervention addresses the well-established body of literature showing that, compared to less materialistic children, materialistic children ingest more advertising through their frequent exposure to commercial media (see Kasser, 2016a). These interventions therefore attempt to decrease children’s exposure to, and acceptance of, social models proclaiming the worth of materialistic aspirations. Some work shows that when parents actively teach their children about the purposes of advertising and criticize ads’ intentions, children’s materialistic tendencies decline (Buijzen, 2007; Buijzen & Valkenburg, 2005). Kasser et al. (2014) integrated this work with ideas derived from the other types of interventions described above by testing an in-depth intervention to decrease adolescents’ materialism. After completing baseline measures of well-being and materialism, adolescents and one of their parents were randomly assigned to a no-treatment control group or to an intervention adapted from an established financial literacy curriculum. Over the course of three, 3-hour group sessions, adolescents and their parents engaged in a variety of activities designed to help the adolescents question the messages they receive from consumer society that encourage them to spend money and acquire stuff; adolescents were also encouraged to save and share more of their money and to develop a values-based spending plan. Materialism and well-being were then assessed again ~2 and ~10 months after the intervention concluded. Two important sets of findings occurred. First, while adolescents in the control group increased in materialism over the course of the study, adolescents in the intervention group decreased in materialism; thus, the intervention was successful and had lasting effects. Second, while adolescents who began the study high in materialism and did not receive the intervention decreased in self-esteem across the course of the study, adolescents who began the study high in materialism and received the intervention increased in self-esteem; thus, the intervention helped “at-risk” adolescents improve their self-image, and these effects were long-lasting. In sum, preliminary evidence suggests that materialism can be decreased through each of the three types of interventions described above. More studies are needed, however, that include samples from a wider range of backgrounds, that involve sustained interactions with study participants (as opposed to one-shot, brief interventions), and that assess study participants’ materialism levels for some months (or years) after the study has ended (as opposed to immediately afterwards). More tightly controlled intervention studies with stronger, placebo-treatment control groups are also necessary to determine whether demand characteristics might explain the apparent success of some interventions. Some evidence suggests that the decreases in materialism that occur after successful interventions are associated with increases in well-being, but more studies are needed to replicate such findings. Finally, no studies, to my knowledge, have explored whether interventions that decrease materialism also decrease materialistic individuals’ tendency to treat other people and the Earth in ways that undermine others’ well-being; research is needed to explore these types of outcomes. In conclusion, I hope this review has helped readers to see that empirical evidence supports the conclusions that: a) materialism can be fruitfully understood as a fundamental aspect of the human value system; b) the more that people prioritize materialistic values and goals, the lower their personal well-being; c) the more that people prioritize materialistic values and goals, the more likely they are to treat other people and the Earth in ways that undermine others’ well-being; and d) it is possible to intervene in people’s lives in ways that decrease their focus on materialism and increase their well-being. While substantial research supports each of these conclusions, I hope that readers also see that much empirical work remains to be done to flesh out and better explain each of these conclusions. 1Given this definition and these operationalizations of materialism, the current chapter does not review the growing research literature on the associations between well-being and how people use their money, e.g., if they spend it on experiences (Van Boven & Gilovich, 2003) or prosocially (Dunn, Aknin, & Norton, 2008). It would be interesting, however to connect these two literatures more explicitly, especially given that experiential and prosocial spending might reflect a person’s attempt to incorporate intrinsic values into their monetary behavior. Bauer, M. A., Wilkie, J. E. B., Kim, J. K., & Bodenhausen, G. B. (2012). Cuing consumerism: Situational materialism undermines personal and social well-being. Psychological Science, 23, 517–523. Belk, R.W. (1983). Worldly possessions: Issues and criticisms. Advances in Consumer Research, 10, 514–519. Briggs, E., Landry, T., & Wood, C. (2007). Beyond just being there: An examination of the impact of attitudes, materialism, and self-esteem on the quality of helping behavior in youth volunteers. Journal of Nonprofit & Public Sector Marketing, 18, 27–45. Brown, K.W., & Kasser, T. (2005). Are psychological and ecological well-being compatible? The role of values, mindfulness, and lifestyle. Social Indicators Research, 74, 349–368. Brown, K.W., Kasser, T., Ryan, R.M., Linley, A.P., & Orzech, K. (2009). When what one has is enough: Mindfulness, financial desire discrepancy, and subjective well-being. Journal of Research in Personality, 43, 727–736. Buijzen, M. (2007). Reducing children’s susceptibility to commercials: Mechanisms of factual and evaluative advertising interventions. Media Psychology, 9, 411–430. Buijzen, M., & Valkenburg, P.M. (2005). Parental mediation of undesired advertising effects. Journal of Broadcasting & Electronic Media, 49,153–165. Burroughs, J.E., & Rindfleisch A. (2002). Materialism and well-being: A conflicting values perspective. Journal of Consumer Research, 29, 348–370. Carroll, J.S., Dean, L.R., Call, L.L., & Busby, D. M. (2011). Materialism and marriage: Couple profiles of congruent and incongruent spouses. Journal of Couple & Relationship Therapy: Innovations in Clinical & Educational Interventions, 10, 287–308. Caruso, E.M., Vohs, K.D., Baxter, B., & Waytz, A. (2013). Mere exposure to money increases endorsement of free-market systems and social inequality. Journal of Experimental Psychology: General, 142, 301–306. Cohen, P., & Cohen, J. (1996). Life values and adolescent mental health. Hillsdale, NJ: Erlbaum. Cozzolino, P.J., Staples, A.D., Meyers, L.S., & Samboceti, J. (2004). Greed, death, and values: From terror management to transcendence management theory. Personality & Social Psychology Bulletin, 30, 278–292. Dechesne, M., Pyszczynski, T., Arndt, J., Ransom, S., Sheldon, K.M., van Knippenberg, A., & Janssen, J. (2003). Literal and symbolic immortality: The effect of evidence of literal immortality on self-esteem striving in response to mortality salience. Journal of Personality & Social Psychology, 84, 722–737. Deckop, J.R., Giacalone, R.A., & Jurkiewicz, C. (2015). Materialism and workplace behaviors: Does wanting more result in less? Social Indicators Research, 121, 787–803. Deneulin, S., & McGregror, A.J. (2010). The capability approach and the politics of a social conception of wellbeing. European Journal of Social Theory, 13, 501-519. Devoe, S.E., & House, J. (2012). Time, money and happiness: How does putting a price on time affect our ability to smell the roses? Journal of Experimental Social Psychology, 48, 466–474. Dittmar, H. (2008). Consumer culture, identity and well-being: The search for the “good life” and the “body perfect.” Hove, England: Psychology Press. Flanagan, C., Gallay, L.S., Gill, S., Gallay, E., & Naana, N. (2005). What does democracy mean? Correlates of adolescents’ views. Journal of Adolescent Research, 20, 193–218. Forman, N. (1987). Mind over money. Toronto, Ontario, Canada: Doubleday. Foulkes, L., Seara-Cardoso, A., Neumann, C. S., Rogers, J. S. C., & Viding, E. (2014). Looking after number one: Associations between psychopathic traits and measures of social motivation and functioning in a community sample of males. Journal of Psychopathology & Behavioral Assessment, 36, 22-29. Frey, B., & Oberholzer-Gee, F. (1997). The cost of price incentives: An empirical analysis of motivation crowding out. American Economic Review, 87, 746–755. Fritsche, K., Jonas, E., Kayser, D.N., & Koranyi, N. (2010). Existential threat and compliance with pro-environmental norms. Journal of Environmental Psychology, 30, 67–79. Fromm, E. (1976). To have or to be? New York, NY: Harper & Row. Gasiorowska, A., Zaleskiewicz, T., & Wygrab, S. (2012). Would you do something for me? The effects of money activation on social preferences and social behavior in young children. Journal of Economic Psychology, 33, 603–608. Goldberg, M.E., & Gorn, G.J. (1978). Some unintended consequences of TV advertising to children. Journal of Consumer Research, 5, 22–29. Grouzet, F.M.E., Kasser, T., Ahuvia, A., Fernandez-Dols, J.M., Kim, Y., et al. (2005). The structure of goal contents across 15 cultures. Journal of Personality & Social Psychology, 89, 800–816. Hope, N.H., Milyavskaya, M., Holding, A.C., & Koestner, R. (2014). Self-growth in the college years: Increased importance of intrinsic values predicts resolution of identity and intimacy stages. Social Psychological & Personality Science, 4, 705–712. Hurst, M., Dittmar, H., Bond, R., & Kasser, T. (2013). The relationship between materialistic values and environmental attitudes and behaviors: A meta-analysis. Journal of Environmental Psychology, 36, 257-269. Jiang, J., Song, Y., Ke, Y., Wang, R., & Liu, H. (2016). Is disciplinary culture a moderator between materialism and subjective well-being? A three-wave longitudinal study. Journal of Happiness Studies, 17, 1391-1408. Kasser, T. (2011). Cultural values and the well-being of future generations: A cross-national study. Journal of Cross-Cultural Psychology, 42, 206-215. Kasser, T. (2016a). Materialistic values and goals. Annual Review of Psychology, 67, 489-514. Kasser, T. (2016b). Materialistic values and well-being: Problems and policy. In S. Bartolini, E. Bilancini, L. Bruni & P. L. Porta (Eds. ), Policies for happiness (pp. 129-148). New York: Oxford University Press. Kasser, T., & Linn, S. (2016). Growing up under corporate capitalism: The problem of marketing to children, with suggestions for policy solutions. Social Issues & Policy Review, 10, 122-150. Kasser, T., Rosenblum, K.L., Sameroff, A.J., Deci, E.L., Ryan, R.M., et al. (2014). Changes in materialism, changes in psychological well-being: Evidence from three longitudinal studies and an intervention experiment. Motivation & Emotion, 38, 1–22. Kasser, T., & Ryan, R. M. (1993). A dark side of the American dream: Correlates of financial success as a central life aspiration. Journal of Personality & Social Psychology, 65, 410–422. Kasser, T., & Sheldon, K.M. (2000). Of wealth and death: Materialism, mortality salience, and consumption behavior. Psychological Science, 11, 348–351. Kolodinsky, R.W., Maden, T.M., Zisk, D.S., & Henkel, E.T. (2010). Attitudes about corporate social responsibility: Business student predictors. Journal of Business Ethics, 91, 167–181. Lambert, N.M., Fincham, F.D., Stillman, T.F., & Dean, L.R. (2009). More gratitude, less materialism: The mediating role of life satisfaction. Journal of Positive Psychology, 4, 32–42. Lekes, N., Hope, N.H., Gouveia, L., Koestner, R., & Philippe, F.L. (2012). Influencing value priorities and increasing well-being: The effects of reflecting on intrinsic values. Journal of Positive Psychology, 7, 249–261. Lykins, E.L.B., Segerstrom, S.C., Averill, A.J., Evans, D.R., & Kemeny, M.E. (2007). Goal shifts following reminders of mortality: Reconciling posttraumatic growth and terror management theory. Personality & Social Psychology Bulletin, 33, 1088–1099. McHoskey, J. W. (1999). Machiavellianism, intrinsic versus extrinsic goals, and social interest: A self-determination theory analysis. Motivation and Emotion, 23, 267-283. Nickerson, C., Schwarz, N., Diener, E., & Kahneman, D. (2003). Zeroing in on the dark side of the American dream: A closer look at the negative consequences of the goal for financial success. Psychological Science, 14, 531–536. Otero-López, J.M., & Villardefrancos, E. (2013). Five-factor model personality traits, materialism, and excessive buying: A mediational analysis. Personality & Individual Differences, 54, 767–772. Roberts, J.A., & Roberts, C.F. (2012). Money matters: Does the symbolic presence of money affect charitable giving and attitudes among adolescents? Young Consumers, 13, 329–336. Roberts, B.W., & Robins, R.W. (2000). Broad dispositions, broad aspirations: The intersection of personality traits and major life goals. Personality & Social Psychology Bulletin, 26, 1284–1296. Ryan, R. M., & Deci, E. L. (2017). Self-determination theory: Basic psychological needs in motivation, development, and wellness. New York, NY: Guilford Press. Schwartz, S.H. (1992). Universals in the content and structure of values: Theory and empirical tests in 20 countries. In M. Zanna (Ed. ), Advances in experimental social psychology, vol. 25, (pp. 1–65). New York: Academic Press. Schwartz, S. H. (1999). A theory of cultural values and some implications for work. Applied Psychology: An International Review, 48, 23-47. Sheldon, K.M., Arndt, J., & Houser-Marko, L. (2003). In search of the Organismic Valuing Process: The human tendency to move towards beneficial goal choices. Journal of Personality, 71, 835–869. Sheldon, K. M., & Kasser, T. (1995). Coherence and congruence: Two aspects of personality integration. Journal of Personality and Social Psychology, 68, 531-543. Sheldon, K. M., & Kasser, T. (1998). Pursuing personal goals: Skills enable progress, but not all progress is beneficial. Personality and Social Psychology Bulletin, 24, 1319-1331. Sheldon, K. M., Sheldon, M. S., & Osbaldiston, R. (2000). Prosocial values and group assortation in an N-person prisoner’s dilemma. Human Nature, 11, 387-404. Shrum, L.J., Wong, N., Arif, F., Chugani, S.K., Gunz, A., et al. (2013). Reconceptualizing materialism as identity goal pursuits: Functions, processes, and consequences. Journal of Business Research, 66, 1179–1185. Sirgy, M. J. (1998). Materialism and quality of life. Social Indicators Research, 43, 227–260. Solberg, E.C., Diener, E., & Robinson, M.D. (2004). Why are materialists less satisfied? In T. Kasser & A. D. Kanner (Eds. ), Psychology and consumer culture: The struggle for a good life in a materialistic world (pp. 29–48). Washington, DC: American Psychological Association. Stillman, T.F., Fincham, F.D., Vohs, K.D., Lambert, N.M., & Phillips, C.A. (2012). The material and immaterial in conflict: Spirituality reduces conspicuous consumption. Journal of Economic Psychology, 33, 1–7. Tang, T. L. P. (1992). The meaning of money revisited. Journal of Organizational Behavior, 13, 197–202. Twenge, J.M., Gentile, B., DeWall, C.N., Ma, D.S., Lacefield, K., & Schurtz, D.R. (2010). Birth cohort increases in psychopathology among young Americans, 1938–2007: A cross-temporal meta-analysis of the MMPI. Clinical Psychology Review, 30, 145–154. Van Boven, L., & Gilovich, T. (2003). To do or to have? That is the question. Journal of Personality & Social Psychology, 85, 1193–1202. Wang, R., Liu, H., Jiang, J., & Song, Y. (2017). Will materialism lead to happiness? A longitudinal analysis of the mediating role of psychological needs satisfaction. Personality & Individual Differences, 105, 312-317. Watson, D. C. (2014). Materialism: Profiles of agreeableness and neuroticism. Personality & Individual Differences, 56, 197-200. Weinstein, N., Przybylski, A.K., & Ryan, R.M. (2009). Can nature make us more caring? Effects of immersion in nature on intrinsic aspirations and generosity. Personality & Social Psychology Bulletin, 35, 1315–1329. Wierzbicki, J., & Zawadzka, A.M. (2016). The effects of the activation of money and credit card versus that of activation of spirituality—which one prompts pro-social behaviours? Current Psychology, 35, 344-353.